Simplilearn’s R training is an ideal package for aspiring analytics professionals to gain expertise in data analytics. By the end of the training, participants will be competent in the applications of the R programming language, such as for data visualization, exploration, and statistical concepts like linear & logistic regression, cluster analysis, and forecasting. The open source analytics market is gaining momentum and this has resulted in huge demand for the R certification. With $14.4 billion in revenue, the analytics market requires 250,000 certified analytics professionals to handle ever-increasing volumes of data. Top companies like Amazon, Google, Oracle, IBM, Microsoft and Dell are looking for certified and skilled analysts to meet this challenge head-on. Additionally, the Big 4 audit firms – PWC, E&Y, Deloitte, and KPMG, are hiring data scientists in large numbers. Gain fundamental knowledge on analytics and how it assists with decision making. Work with confidence using the R language. Develop a structured approach to use statistical techniques and R language. Perform sharp data analysis to make business decisions. Certified data scientists draw a lucrative salary with excellent growth prospects. 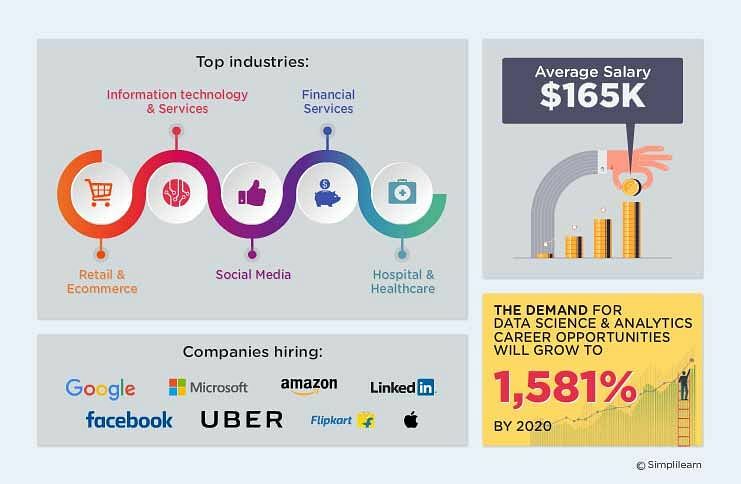 Statistics from KDNuggets suggest a tremendous salary increase with a certification, at 50% and 13% in Asia and the rest of the world, respectively. According to Indeed.com, certified R data scientists earn an average of $97, 000 and are sought-after in Fortune 500 companies. A data science credential opens up career opportunities in almost every industry and vertical. Data science skills are also quickly becoming transferable between industries. This course is meant for students and professionals looking to enter the field of data analytics and aspire to become a data scientist. This course forms an ideal package for aspiring data analysts aspiring to build a successful career in analytics/data science. By the end of this training, participants will acquire a 360-degree overview of business analytics and R by mastering concepts like data exploration, data visualization, predictive analytics, etc. This course can be taken up by anyone, and would greatly benefit those with strong logical reasoning and math skills. What projects are included in the course? Healthcare : In the healthcare industry, predictors are useful when data insights are used to design effective interventions. Predictive analytics is also used in healthcare to mediate hospital readmissions. Insurance : Predictive analytics has been greatly beneficial to insurance companies, according to the 2013 Insurance Predictive Modeling Survey. Analytics has been a boon to insurance companies, as they can now track, draw insights, and analyze the ongoing trends on the market. Retail : Analytics will help organizations optimize On-Shelf availability, manage inventory, predict retail trends in specific geographies, analyze the effect of promotions on products, monitor the lifecycle of a product, and regulate production to avoid wastage. Past data helps paint an accurate picture of the various contributing factors that influence the retail industry. Internet : Internet analytics is the collection, modeling, and analysis of user-data in large-scale online services, such as social networking, e-commerce, search, and advertisement. Specifically, we look at social & information networks, recommender systems, clustering and community detection, dimensionality reduction, stream computing, and online ad auctions. 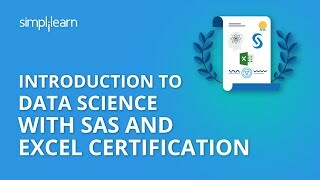 How do I get certified in the Data Scientist with R program? Completing any one of the four projects. The outcome of the project will be evaluated by the lead trainer. Important screenshots of the project should be submitted via LMS. Clearing the online examination with a minimum score of 80%. Note: It is mandatory that a participant fulfills both the criteria, i.e., completion of 1 project, and clearing the online exam with a minimum score of 80% to be certified. Excellent course to gain basic operational know-how of R & SAS. I am able to understand and also practice. The course is wonderful! The course is well structured for professionals who are looking to break into the analytics domain and wish to master the skills. The industry projects are the best part which spans across diverse domains. I am from the healthcare domain and found the healthcare project very interesting. The trainers are very good and bring a lot of industry context to the table. I am very happy with the training. Thoroughly planned topics relevant to the course and covers a wide variety of scenarios for data analysis. Pace of each lesson is perfect. Good course. Many examples and demos. Love it. Course is very well organized. Keep up the good work!